There's nothing like the feeling of dread when you see a sneaky flea making its home on your pet. Four Paws Flea Comb is an excellent tool for the convenient and cost effective removal of fleas. 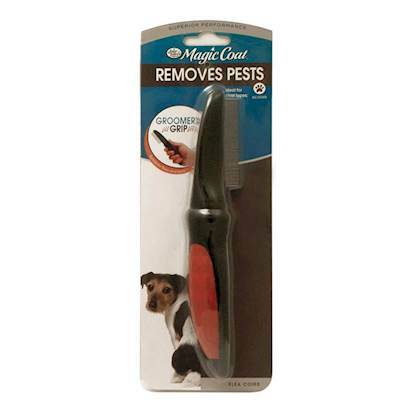 Use this high-quality comb to inspect and remove unwanted pests from your pet's coat. When you use the comb, the fine prongs will separate the fur and allow you to see and remove fleas, ticks, and nits. The comb is free of harsh chemicals and medications, so you can use it every day. Four Paws Flea Comb can also be used to remove uncomfortable tangles and shedding hair making it a versatile and invaluable addition to your grooming kit. Slowly and gently comb through your pet's coat working toward the skin. Be careful not to scratch their skin as you check for fleas, ticks, and nits. If you hit a mat or tangle, work through it with the comb.